Heading further South, then inland, towards Palm Desert. I had a very good trip, all the way to Australia, i stayed in Fremantle, near Perth, on the West coast of Australia, visiting my daughter and her family. I had not seen them for four years. So, now i will continue with the Westy trip, and i had better get going, we will be leaving here soon, and i wont know if i will have internet. As we were heading South, the towns seemed to be more friendly, more social, maybe also because of the many tourists that visit here, but stopping in Oceanside,Carlsbad and Encinitas, we felt quite at home, we loved the little ,cozy coffee shops, and it sure helps naturally, that the weather was great, sitting in a small courtyard, watching life go by, sipping a wonderful latte, well, there is not much wrong with that. We stayed overnight in Encinitas, and then headed South, towards San Diego and then inland. Near San Diego, off of Interstate 15, near the town of Rainbow, i spied a bunch of tents, with lots of action,a market!!!!!!! 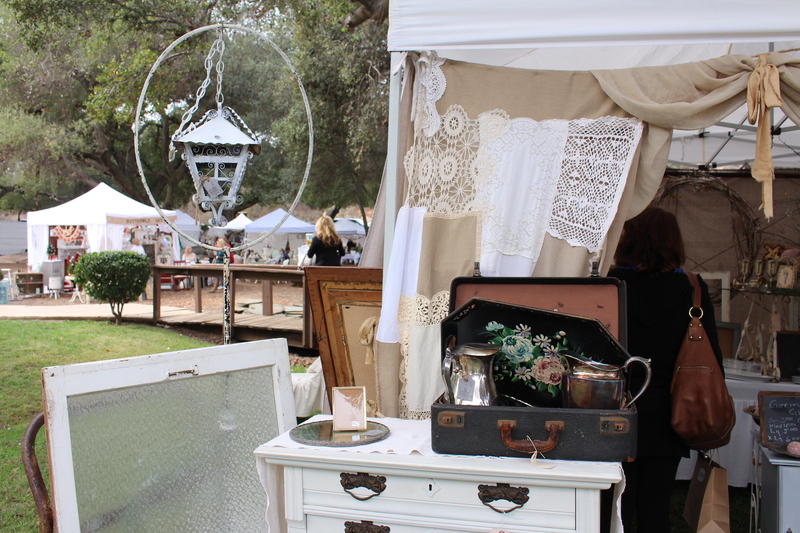 usually, you can find wonderful local art at these markets, but this one in particular was a vintage marketplace, only held every 2 years, so i lucked out!! Bert realized i would be lost for a bit, so he went looking for a quiet spot to sit and watch the action. I have never seen so much stuff, so many vintage items, some truly worth a second look, others seem to have been dug out of a long forgotten basement or attic. People were all dressed up in early 1900 clothing, and every one spoke with a Southern drawl, i was so out of place, with my dutch/canadian accent, i kept quiet as much as i could, unless i was buying something. I found some beautiful old lace for one of my friends. Most of the ladies were wearing long gowns, and had tower high ,very blond hair, together with bright red lipstick, oh my goodness, and here i was, my natural self!!!!! But i had fun, such a different world!!! !